Neato Robotics Botvac 85 Robot Vacuum 945-0110 Powerful Suction with blade brush. Brand new Sealed Unit, Official UK Stock, Full manufacturer Warranty. Laser-guided navigation system scans and maps the room, plans, and methodically cleans-instead of just bumping around. Combines powerful suction with a blade brush, precise edge cleaning side brush, bagless bin, and extra-large filter. Automatically goes from room to room. When it needs more juice, it goes to its charging base then returns to where it left off. Control Centre-Easily schedule daily cleanings or just push a button for instant multi-room or spot cleaning. Comes with easy-to-swap heavy-duty blade brush, combo brush, and three high-performance filters. 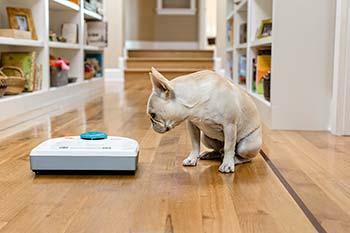 The Neato BotVac 85 uses advanced robotic technology and thoughtful design to vacuum homes thoroughly and methodically. Housed in a brilliant white case with Laguna blue accent colors, it offers even greater vacuuming efficiency and capacity for picking up more dust and allergens that lurk in homes. The foundation of Neatos robotic technology is its patented Neato BotVision. BotVision uses proprietary navigation software that is based on SLAM (Simultaneous Localization and Mapping). It also utilises its own proprietary laser scanner. Neatos proprietary laser distance system continually scans a room, making instant decisions based on input from its external sensors. This enables Neato robots to create detailed and accurate maps of their environment and then methodically vacuum in straight lines, instead of bumping around a room randomly. As a result, Neato cleans a room much more quickly than other robot vacuums. In addition, the orderly and directional navigation made possible by BotVision meant Neato could design a D-shaped robot with three straight sides and a large brush positioned across the full width of the robot, not just in a small space in the centre of a circle. Because of its shape, Neato cleans close to the walls and gets into corners. Designed to hug walls for maximum cleaning power, it cleans within 10 millimetres of the wall and even includes a side brush to pick up every speck of dust. Its larger dirt bin holds more captured dirt, dander, pet hair and allergens and is easy to empty. A real smarty vac. Neato BotVac uses patented Neato technology to scan the room, plan the most efficient course and complete the job in record time. Detects obstacles. Sees, senses and responds to furniture, toys and stairs, carefully moving around them, without missing a spot. Cleans where you dont. And others cant. Neato BotVac can even see in the dark. It goes under cabinets and furniture to spot and capture hiding dust bunnies. A real vacuum: Neato robots are built from the ground up to be true vacuums, not sweepers, with the powerful suction users want from their vacuum. Dirt Defying Cleaning System. Neato BotVac combines powerful suction and versatile brushes, bigger-is-better bagless bin, and extra-large filter that captures particles as small as 0.3 microns, like mould and pet dander. Square and proud. Neato BotVac has a thoughtfully designed square shape, so it can edge along walls and go deep into corners. Keeps itself charged. When Neato BotVac needs more juice, it goes to its charging base then returns to where it left off and finishes the job. Gets smarter over time. As new features become available, you can download them right into your Neato BotVac. Itll love the extra boost. And youll love your Neato BotVac even more. Versatile Brush System--easy-to-swap combo and blade brushes for maximum cleaning flexibility. Perfect for all floor types and pet hair pick-up. The precise edge cleaning side brush makes sure not a speck of dust is left behind. Best at picking up pet hair. Ideal for pet owners and allergy sufferers. Precise edge cleaning side brush. Neato BotVacs precise edge cleaning side brush makes sure not a speck of dust escapes its path. Cleans when and where you want. Schedule daily, instant multi-room, and spot cleaning. 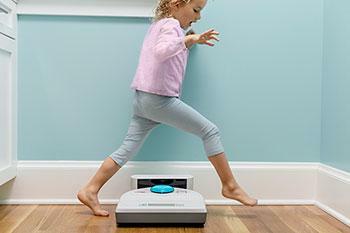 Easily schedule daily cleanings or just push a button for instant multi-room or spot cleaning. Comes with the heavy-duty blade brush, combo brush and three high-performance filters.